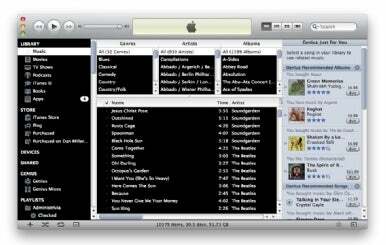 When you restart iTunes, you'll have a high-contrast sidebar and list pane. To undo it, repeat the command but change the TRUE to FALSE. By "high-contrast," this tipster means, "stark black and white." Many users who have tried this tip say they like the results less than the new all-gray and so undo it. It doesn't look great in the new default Album List view (View -> As Album List or Option-Command-4); it looks better (relatively speaking) in plain List View (View -> As List or Option-Command-3).